Putin’s Crimea revenge: Ever since the U.S. bombed Kosovo in 1999, Putin has been planning to get even. On March 24, 1999, the U.S. bombed Kosovo. Putin has been planning his payback ever since. 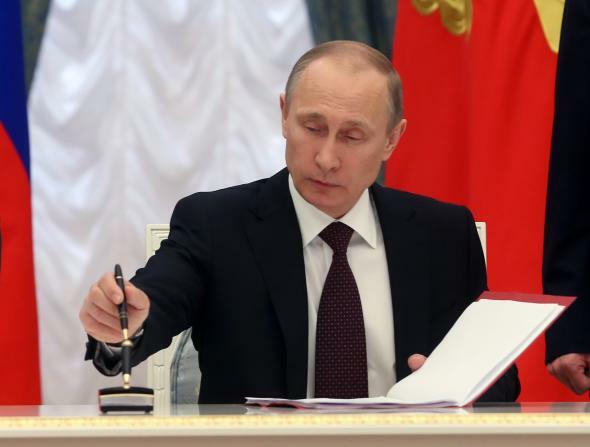 Russian President Vladimir Putin signs a law making Crimea part of Russia during a ceremony in the Kremlin in Moscow on March 21, 2014. Fifteen years ago this week, I broke a promise I’d given to myself: After being captured and threatened with execution by Kosovar guerrillas the year before, I had sworn to give up war reporting. Now I was on my way to Belgrade to report on the effects the NATO bombing campaign was having on Serbia. When friends challenged my decision, I explained that I thought the course of history was changing at that very moment and I had to document it. I was wrong about the documenting-it part: I stayed in the region for six weeks, writing a number of stories, including 34 separate dispatches for Slate from Serbia, Montenegro, and Macedonia, but it took a lot longer than that for the catastrophic historic change to become evident. It has taken 15 years. Russia’s invasion of Ukraine completes that story. On March 24, 1999, Russian Prime Minister Yevgeny Primakov was on his way to Washington when he got word that NATO had begun bombing Kosovo. He ordered his plane turned around. A few hours later, he landed in a Moscow that was reeling from the insult of not being consulted. Russians had only a vague idea of what Kosovo was but a very strong concept of Serbia being a land of fellow Eastern Orthodox Slavs and of Yugoslavia being a rightful part of Moscow’s sphere of influence. Not being consulted—or even, apparently, warned—sent the very clear message that the U.S. had decided it now presided over a unipolar world. There was no longer even the pretense of recognizing Russia’s fading-superpower status: President Bill Clinton had chosen not to wait the few hours it would have taken for Primakov to land in Washington, allowing him to save face by at least pretending to have been in on the conversation. From this point on, Russian President Boris Yeltsin’s administration, already weak and embattled, would be unable to justify its friendly, perennially de-escalating posture toward the West. Anti-American feelings ran so high you would have thought the U.S. were bombing Russia. By turning his plane around, Primakov had endeared himself to the nationalist opposition and turned his back on Yeltsin. The liberals in Moscow were in a panic. The nationalists were mobilizing not only politically but also militarily: Men lined up outside the Yugoslav Embassy in Moscow to sign up to volunteer to defend Serbia. The mood I found in Belgrade matched Moscow’s perfectly. The country was mobilizing in support of its nationalist leader, Slobodan Milosevic. The few groups and people who continued to oppose him grew more marginalized and embattled by the day. They also grew increasingly paranoid, which paralyzed them. A daily concert in the center of town was literally drumming up support for the war effort, which had acquired the proud status of a defense effort—against the Americans, no less. A popular Russian rock group previously known as pro-Western came to play. When a young Serb opposition activist of my acquaintance got his draft notice, he readily donned the uniform: He did not want anyone to think anti-Milosevic activists were unpatriotic. When I returned to Moscow in mid-May, the liberals’ panic and the nationalists’ fervor had subsided, but I found signs of the nationalists’ newfound strength—and wrote my final dispatch about that. And then history followed its changed course. In August, Yeltsin anointed as his successor, a virtual unknown named Vladimir Putin. Within a few weeks, Putin became spectacularly popular by launching a new war in Chechnya. Politicians formerly known as liberals praised the Russian army for its performance there; one said it was “regaining its dignity.” He did not mention Kosovo, but he was referring to the general sense of humiliation that had stayed with Russians since the spring. In December 1999, Putin became acting president, and the following March, he was elected to the office. Over the course of the following 14 years, he nurtured in the Russian public a sense of nostalgia for the Soviet Union and especially for the fear it inspired in the rest of the world. In 2008, Russia invaded the former Soviet republic of Georgia and effectively annexed part of its territory. And now it has done the same with Ukraine. This time Putin mentioned Kosovo. Indeed, in his speech to parliament on Tuesday, he made it very clear that by annexing Crimea he had avenged Russia for what had happened with Kosovo. This raises three questions. First, if Putin thinks he is paying the West back for Kosovo, why has he waited so long to strike? Second, what could the United States have done differently to avoid setting off this long and frightening chain reaction? And finally, what can the United States do now? In retrospect, the long wait makes perfect sense. Once Putin held power in Russia, he never planned to cede it, so he had all the time in the world. Two of Putin’s key character traits are vengefulness and opportunism. He relishes his grudges and finds motivation in them: He has enjoyed holding the bombing of Yugoslavia against the United States all these years—and knowing he would strike back some day. He is anything but a strategic planner, so this knowledge was abstract until it wasn’t, when the opportunity to grab Crimea presented itself. Revenge has been sweet, but when other opportunities present themselves—and this will happen more often now, at least from Putin’s point of view—he will deploy Russian military force or the threat of Russian military force in other neighboring countries. He will take his revenge not only cold but plentifully. Could the United States and its allies have undertaken anything other than military intervention to resolve the Kosovo crisis? In fact, they did. After the bombing campaign, which strengthened support for Milosevic and weakened his opponents, the U.S. poured cash into rebuilding the Serbian opposition. The funding was contingent on the disparate opposition groups agreeing to work together and attending regular coordination meetings held in Budapest, Hungary, and run by people whom participants understood to represent the State Department. The plan for the anti-Milosevic revolution was worked out in these meetings down to the smallest detail, including where the leaders of each of the 18 participating political organizations would be if mass protests broke out in Belgrade. They did, in October 2000, and Milosevic didn’t seem to know what hit him. Could a plan like that have been carried out without the NATO bombing campaign? Could Milosevic have been removed sooner without the bombing? I think so. On the other hand, would he have succeeded in killing and displacing many more people in Kosovo before being deposed, if it hadn’t been for the NATO intervention? This is an impossible question to answer. What we do know is that Yugoslavia’s wars were very much one man’s wars, and it was the removal of that man from power, not the bombing, that finally ended them. Russia’s wars are, similarly, Putin’s wars. It is also impossible to know whether Putin would have happened to Russia if it had not been for the bombing of Yugoslavia. I believe he would not have. But now that he has been in power for more than 14 years and is planning to stay forever, what should the United States do? Bombing Moscow does not seem to be an option. But helping the Russian opposition in the same committed, involved, and even meddling manner as the U.S. once helped the Serbian opposition should be. Putin already believes the U.S. State Department is backing the few protest activists left in Moscow—and is punishing the activists for it. There are many differences between Putin today and Milosevic 15 years ago, all of which boil down to the fact that Putin is a lot stronger and harder to remove—all the more reason for the U.S. to put its best minds to work on helping Russians accomplish just this. It may be our only chance of righting the course of history.